Baptism is the Church’s sacrament of welcome and the gateway to all the other sacraments. The Baptism of a child is a very special occasion in the life of a family. It is also a very special occasion in the life of the Church. Just as we welcome a child into our families, so too the Church welcomes children into the family of God. Baptism initiates a person into the Christian Community, making them children of God and members of the local parish. Baptism is a graced moment in which we meet God, and the decision to celebrate the sacrament deserves careful consideration. 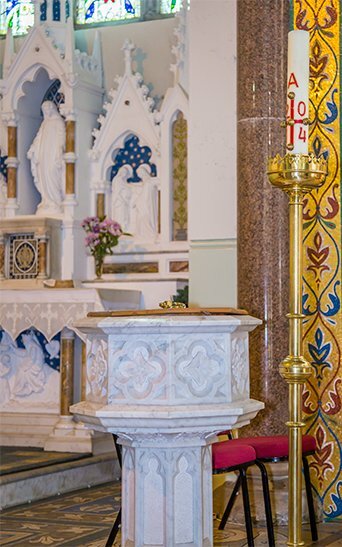 The Sacrament of Baptism is celebrated in this parish on the first and third Sunday of each month at 1.15p.m. in the church. Arrangements for same should be made through the parish office. One month’s notice is required. Parents are required to fill out a Baptism Enquiry Form which can be downloaded here. BAPTISM ENQUIRY FORM The form should be completed and returned to the Parish Office.